Also written by Hector Oesterheld , El Eternauta was serialised in Gente magazine in 1969. Technically it is El Eternauta II; the original was written by Oesterheld and drawn by Francisco Solano Lopez for Hora Cero, starting in 1958. Both versions feature a time traveller (the "eternaut") who visits Oesterheld to warn of a future disaster. The much more political overtones of the second version may have helped contribute to Oesterheld's eventual demise (see part 3 of this article). 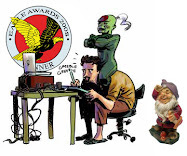 From the late 1960’s on, Breccia began experimenting with new techniques for creating comic art. 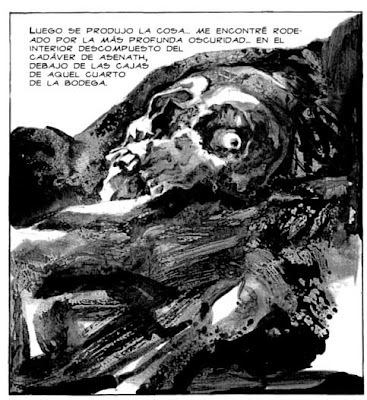 From what I’ve been told, El Eternauta was drawn using oil-based inks on a glass table, which allowed Breccia to create the unique swirl textures found in what would normally be solid blacks (see the shadows in the first of the two panels above). The normal procedure for reproducing artwork at this time was to make a drawing on paper, photograph it, then use the resulting negative to make a printing plate. Because Breccia was drawing directly onto a glass sheet, light could be shone through it to make a printer’s negative by means of photographic contact printing. Once the negative was developed, the glass sheet would be scraped clean and the next page drawn onto it in turn!! I suspect this technique must have been difficult to control, as some of the drawing in El Eternauta seems a bit shaky compared to Mort Cinder; some of the panels are also very abstract and frankly, pretty difficult to read. Reader reaction at Gente was apparently pretty negative, and the strip finished rather abruptly. 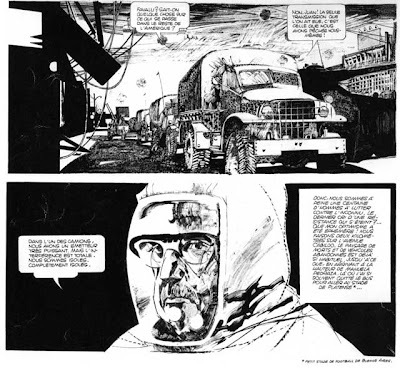 Nevertheless, El Eternauta represents a step towards the future; Breccia’s taken the idea of using chiaroscuro, but with detail or texture added in the “black” areas, one step further. Between 1972 and 1975, sometimes in collaboration with writer Norberto Buscaglia, Breccia adapted nine stories by H.P. Lovecraft (collected as Breccia-Lovecraft: Los Mitos De Cthulu). Here he really began to play both with technique and style; the early stories feature finely-rendered pen or pencil drawings that were pretty much in keeping with the style of Mort Cinder ten years before; the later stories are rendered in a whirlwind of paint, collage and monoprint that verges at times on the completely abstract. Breccia begins using monoprint (a technique of drawing with slow-drying inks onto a non-porous surface such as glass and then making a one-time transfer onto paper) first as a means of drawing the undrawable - the splodgy textures he produces are perfect for suggesting grisly nastiness (as with the skull, above) or Lovecraft's "unnameable horrors"- and later as a means of generating textures to be used in collage. This collage technique was the one which would feed into his work on Perramus in the 1980’s. *I found myself thinking about this strip during a conversation with the artist Ingebjørg Jensen about ways to represent wreckage and rubble in her graphic novel about the wartime bombing of Bergen. I realised it would be easy to reproduce the effect in Photoshop using scanned textures or digital photographs. That was the start of my interest in simulating Breccia’s collage techniques using digital media. I've read this series of articles many times, man, I've been a fan of Breccia for some years now but only recently I bought Los Mitos de Cthulhu by him and Sasturain... I was impressed by specifically the Call Of Cthulhu adaptation, which indeed is actually an almost abstract comic. I don't know what a guy like McCloud would say about it, but I think that in a case like this the artwork is so obscure that the comic for a moment becomes illustrated prose, with the voice over narration basically hinting you about the indecipherable shapes and letting you connect the dots in your head... Just my two cents. Haha I also had the same photoshop idea after reading this book that you did. The exact same one. Very funny.